French pianist Bruno Rigutto was pretty much only a name to me. I don’t recall having heard a single disc of his, before receiving this 8-CD set to review. I think that’s been my loss. He studied at the Paris Conservatoire, where his teachers included Lucette Descaves and Jean Hubeau. Subsequently he was ‘the sole disciple’ – in the words of the notes – of the volcanic, perplexing Samson François. For a man who won both the Marguerite Long and the Tchaikovsky competitions, he has kept something of a low international profile, though he has worked with many of the world’s leading conductors and instrumentalists. He also composes and teaches. Indeed he succeeded Aldo Ciccolini at his alma mater, the Paris Conservatoire. What follows is a brief outline of this set. I’m going to start out of sequence with disc two which houses a simply splendid recording of Dvořák’s Piano Concerto (original version, not Kurz). Much credit goes to conductor Zdeněk Mácal who brings a wealth of detail and idiomatic rhythm to bear, marshalling the Orchestre Philharmonique de Radio France with great perception. Rigutto plays with flair and imagination and altogether this is one of the best versions of the work now available. It was taped in 1975 and is outstanding in every way. Coupled with it is a less recommendable Tchaikovsky Concerto where the Orchestre National de Monte-Carlo under Yuri Ahronovitch sounds a bit splintery. Backtracking, the first disc is all-Schumann with the Concerto being accompanied by the Orchestre National de France under Kurt Masur, who once again here proves why he is so acutely successful a concerto accompanist. At first Rigutto may seem a touch cautious and reserved but he is holding things back and this thoughtful and musicianly playing has the requisite fire later on. The Fantasie shows his technical reserves and his perceptive understanding. The all-Haydn disc lasts a scant 41-minutes and is not altogether a success, with an occasionally imprecise orchestra. The repertoire is somewhat unusual in the context, though for that reason alone, perhaps, welcome. Disc 4 houses Chopin’s Concerto No.2 with Louis de Froment accompanying. The performance and recording are a bit scrappy - the brass players were having a bit of a raucous off-day – and whilst the recording has little in the way of light and shade Rigutto plays with commendable directness. He plays fluidly in the Ballade No.4 pressing ahead in places. The Sonata No.2 receives a direct reading. There’s plenty more Schumann in disc five. There’s a good Abegg variations and a controlled Toccata. Kinderszenen is rather heavy, careful and strangely un-carefree where it should be most communicative. Rigutto leaves a somewhat didactic impression here but he’s better in the small Liszt selection where the Mephisto Waltz leads the way. Prokofiev and Ravel share disc six, which lasts 38-minutes. The former’s Seventh Sonata receives a laudable reading. He’s not as driving as Richter in the finale but instead treats it as a kind of Jazz Toccata with diverting results. His Ravel – Sonatine, and Alborada del Gracioso (from Miroirs) - is persuasively projected if not with quite the most evocative of sound-worlds. An intermittent problem in this set is the dry recorded sound. Discs 7 and 8 are both all-Chopin, one of his strengths, albeit he is not the most demonstrative practitioners of the composer’s music. The Andante spianato and Grande Polonaise is well conceived, the Polonaises generally convincing. He plays the 14 waltzes plus the op. posthumous ones to form an 18-track 56-minute disc, never as wilful or personalised as his one–time teacher François but possessing strong qualities of his own; never inert, certainly. Not everything here is on the high level of the Dvořák concerto, but the demerits are largely those of inferior recording quality, or occasionally sloppy orchestral accompaniment. 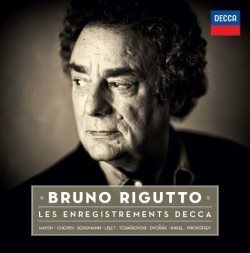 Rigutto himself is well worth listening to. He may seem reserved sometimes, or dryish at others but he has things to say. I wish the notes said more about him.